During normal operation on any iOS device running the SimpleMDM mobile app. When MDM Lost Mode is enabled on supervised devices. This article highlights location tracking during normal operation. For more information on using MDM Lost Mode, refer to the Device Actions article. Location tracking during normal device operation is achieved with the SimpleMDM mobile app. The mobile app uses a combination of native iOS location tracking functionalities to provide frequent, accurate location updates without noticeably affecting a device's battery life. The SimpleMDM mobile app has been installed to the device and opened at least once. The user has allowed background updates, location tracking, and push notifications. The device has an internet connection. The current and historic location of a device can be seen from the device details screen. A current location update can also be requested on this screen by clicking the "Update" button at the lower right of the map. SimpleMDM also provides the option to view all of your devices on a map at once. To see this view, click "Devices" on the left hand side of the screen and click the "Map" button on the top right of the view. Most issues with location tracking stem from permission settings within iOS. The easiest way to determine why a device is not providing location information is to open the SimpleMDM app on the device itself. The SimpleMDM app runs a diagnostics check whenever it is opened and will present helpful information on how to resolve any issues it finds. Q: How often is the location updated? Location updates generally occur once an hour, but the frequency may vary more or less. If the SimpleMDM app detects that the device's location is changing in a significant way, it will provide its updated location to the SimpleMDM service. A significant location change is determined by iOS and is often based on the device switching between nearby cellular towers. Q: How can I prevent the user from disabling location tracking? At this time, it is not technically possible to prevent a user from disabling location tracking in iOS. Q: Is it possible to remotely configure location services on devices? Location services cannot be enabled remotely via MDM at this time; these settings must configured manually on devices. The easiest way to ensure these settings are enabled for the SimpleMDM app is to open the app itself on devices. 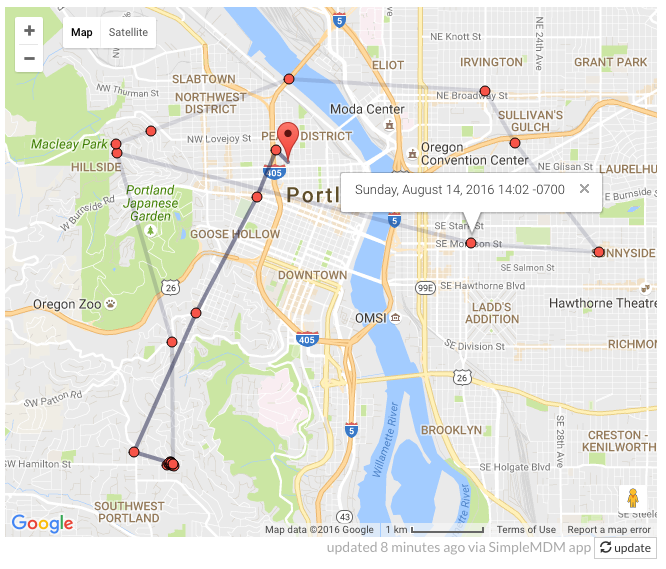 Q: If a user forcefully kills the SimpleMDM mobile app, will location tracking still work? Yes. The SimpleMDM app will re-open in the background after some duration of time. Q: Will location tracking work if I use single app mode? No. iOS does not allow other apps to run while in single app mode (or lock). The SimpleMDM app will not be allowed to operate.